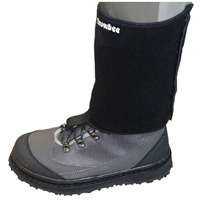 Protect your stocking foot Gravel guard socks and gravel guards from Snowbee and Orvis. 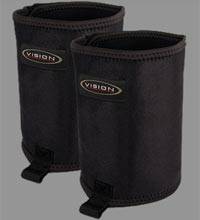 The Vision neoprene gravel guards will fit over any boot and stay put. The neoprene is nylon faced on the inside, and the outside is a brushed, loop fabric making the Velcro closure system infinitely adjustable. They are designed individually for left and right foot. They can also be hooked securely to your wading shoes to avoid riding up. 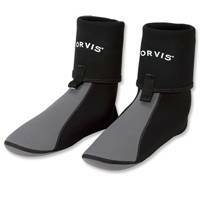 Sculpted, anatomical wading socks of 2.5mm neoprene give maximum comfort on the river. Reinforced boot lace hooks for secure attachment. Integrated gravel guard keeps out debris and gravel. Neoprene wading socks in black/grey. Washable. 3mm double lined Neoprene. Heavy duty zip, plus Velcro flap fastening. Nylon loop tag to lace into boots. 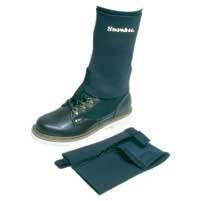 Worn over the top of the wading boots, to prevent gravel and sand entering the boots. Colour: Dk.Green. One size fits all. One size fits all. 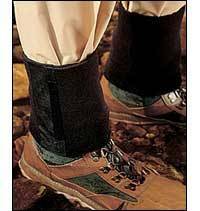 Full-length hook-and-loop closure provides infinite adjustment for maximum protection against wader-damaging sand and gravel. Special nylon lace hook will not detach while wading. Imported.